We worked closely with Alsager Highfields Primary School, to improve their outdoor early years provision and create an environment brimming with exciting outdoor learning opportunities. The early years playground was beginning to look out-dated and lacked outdoor resources for imaginative and child-led play. Due to only having a small outdoor shed with limited space, storage was also an issue. The school’s old canopy was the teachers only other option for storage but this caused clutter and effected the children’s free flow play. We wanted to create an environment that would inspire learning through play and naturally develop children's understanding of the 7 areas of learning. The messy play zone will encourage teamwork and will help develop children's language, communication, PSED and understanding of the world. Children will work together to cook scrumptious mud pies in the Mud Kitchen, build dams on the Damming Station or mix components on the Tuff Spot Table. Take a look at our messy play equipment here that can be used to create your own messy play zone. We built a bespoke performance stage to encourage the children to perform outdoors, take part in role play and express themselves freely. While on the stage, children will develop their confidence, voice projection, spoken language and communication. We also attached mark-making boards to the stage to encourage children to write and create visuals for their performances. To encourage role play, we installed our Giant Playhouse with Walls and Chalkboard. This open-ended resource can be transformed into anything a child’s imagination desires and can be a great tool to help children understand the world around them. One day the Playhouse could be transformed into a Bakery while on another day, an A&E department. As children pretend play their different roles, they will naturally begin to develop key skills and have a better understanding of how the world works. 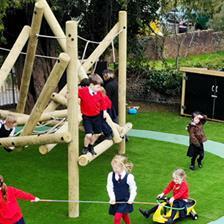 You can view all of our imaginative and creative playground equipment here. 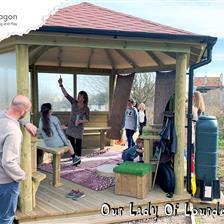 As storage was an original issue for the school, we decided to install our fantastic Play Cabin. This wonderful timber structure can safely store a high amount of playground equipment, while also having the ability to transform into an additional play resource. It includes chalkboards, a shop window and fun bubble windows to encourage further role play activities. 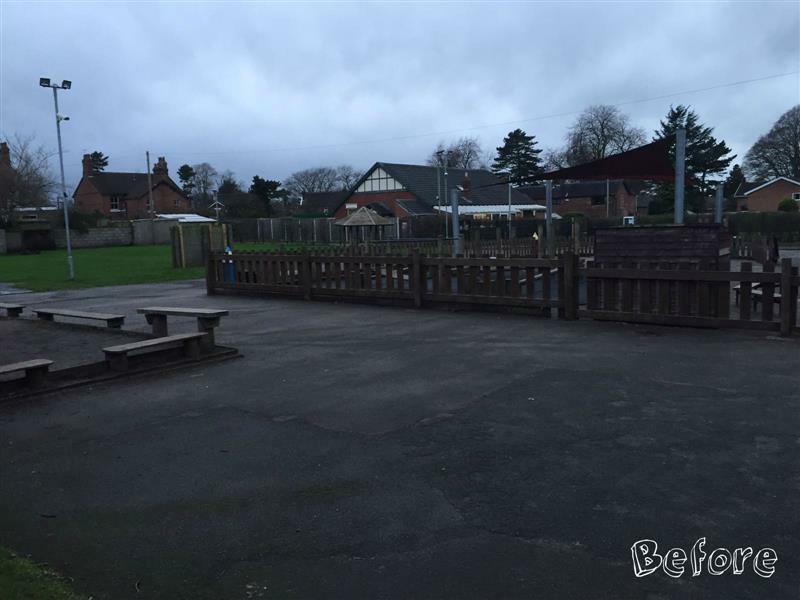 Although we removed the school’s old timber canopy, we wanted to ensure that the children still had excellent free flow access to the outdoor area. We installed an excellent freestanding timber canopy to provide a covered area for play in all-weather conditions. The Canopy design is much more open than the school’s previous version and has open sides to encourage free flow play and learning. You can view our free flow timber canopies here. We created a Roadway Zone for children to ride their bikes and trikes and improve their physical development. The area will also help improve children’s knowledge of road safety and the world around them. The Roadway surface was formed with our fantastic rubber Wetpour surfacing. We also used our Wetpour to create a shop, hospital, school, yellow sand zone and 10+ numbered parking bays that were added at various points along the roadway. This adds to the overall play experience and will help create outdoor lessons and child-led activities. To further encourage healthy activity and physical development, we installed our Tintagel Play Tower. This fun resource includes a climbing wall, net climber, suspension bridge and slide. With active challenges of varying difficulty, Alsager’s children can now build their climbing confidence per their ability, and benefit from taking safe risks. 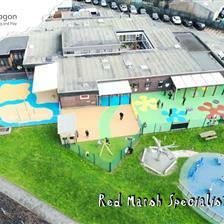 We then resurfaced the area with colourful Wetpour Safety Surfacing which includes a splash design. You can explore all of our active playground equipment here. To provide a dedicated area for sports and ball play, we created an all-weather sports pitch with our Playturf (artificial grass) and pitch markings. The size is ideal for introducing early years children to sports such as football and being on artificial grass, means the area can be accessed in all weather conditions. We created a quiet, reflective and natural area for children to sit, read and explore the natural world. The space includes an all-weather artificial grass surface and a story telling area. The story telling area includes a story telling chair and mushroom seats to give children a place to read their favourite stories whether in a class or on their own in a peaceful environment. This will be a great place for children to relax - especially for those who don’t always enjoy taking part in physical activity or sport. The early years children now have an outdoor learning environment perfectly zoned for different styles of play, as well as having a huge choice of engaging playground equipment to self-select from. With excellent free flow access, this playground development will encourage the children to explore, investigate, run, jump, crawl, climb, relax and simply enjoy being outside. This playground was developed by our Director and Founder, Andy Snell. Are you looking to develop your early years outdoor classroom and create visual pathways to the 7 areas of learning? Feel free to Contact Us and we’ll be back in touch to arrange a free consultation. You can learn more about our excellent playground design process here.